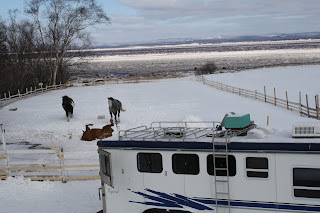 I'm so happy to say that our horses are back home. 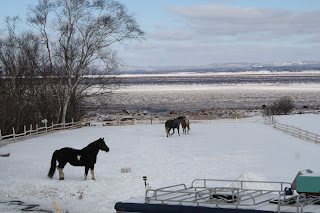 It was challenging - there is still so much ice and snow here, lots more than you'd typically see this time of year. Here are a few pictures to show the snow, and the happy horses in their turn out. So, as you can see, still lots of snow and ice. It's supposed to get up to 11 C. on the weekend, so things should start to look more spring like soon. I haven't said too much about the boarding situation. Because I find the situation there sad I think it's best not to say too much. We did what we could for as long as we could. There were options to make things better that weren't, and are unlikely to be used, and I don't understand anyone making those choices. That's all. Our horses are exuding a joyfulness that I haven't seen in them since they left home - they are rolling, running, playing, grooming one another, lying down to sleep, affectionate and happy. 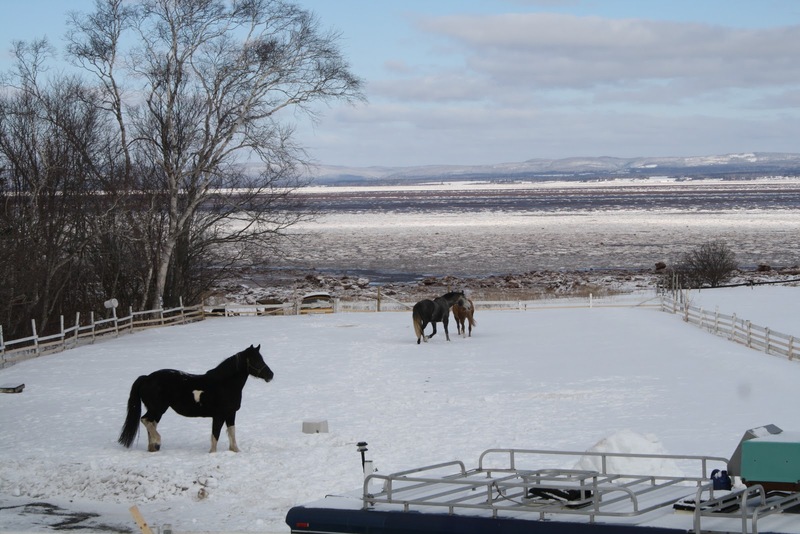 Even though the highs here today were -10 C. and Doug and I have been working outside for days to get them home, we just stood in the turn out gazing at them and being close to them, without even realizing the time going by. 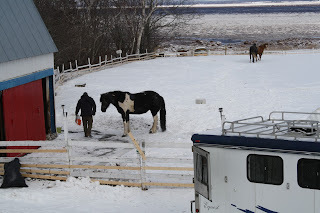 Doug's brothers Gary and Greg came to the rescue in helping dig the trailer and barn doors out of the ice. Moving three horses in these circumstances (very icy footing that needed to be sanded, not conducive to trailer loading) was a bit of a scary undertaking, so having all three safe and sound and in our barn is wonderful. They were so good. Obviously my training and equitation goals are on hold for now. It isn't at all unusual to be riding outside in March and our outdoor has in-ground drainage so it drains really fast. With luck, I'll be riding again in a couple of weeks. In the meantime maybe I'll play around with some clicker training and just enjoy them. Is that the ocean right behind your turnout??!!! What a gorgeous setting (even if it is cold). I'm glad you have the horses home with you. Boarding can be so difficult. Oh they look so happy! If your boarding situation was going downhill, good that you moved them home, and very nice to see them there happy and contented. A lot of people who run boarding facilities get burned out. They make excuses for the situation, but refuse to remedy it because they just don't care anymore. You did the right thing. I love having my horses at home, even if I can't ride as much as I like because of it. There is something very satisfying about seeing them first thing in the morning when I wake up. They look like they are in paradise! How fabulous to have them home. Once the weather improves, all your goals will come together. Being in a relaxed happy environment will only make them easier to achieve. Yay! They look ecstatic. I can't wait until I have a home to keep mine at. Yay! SO happy for you, Doug and the horses. :) As others have already said, you'll catch right back up on your training goals. And you and the horses are already more relaxed and happy. Sending warm weather wishes up your way! That awesome Carol! 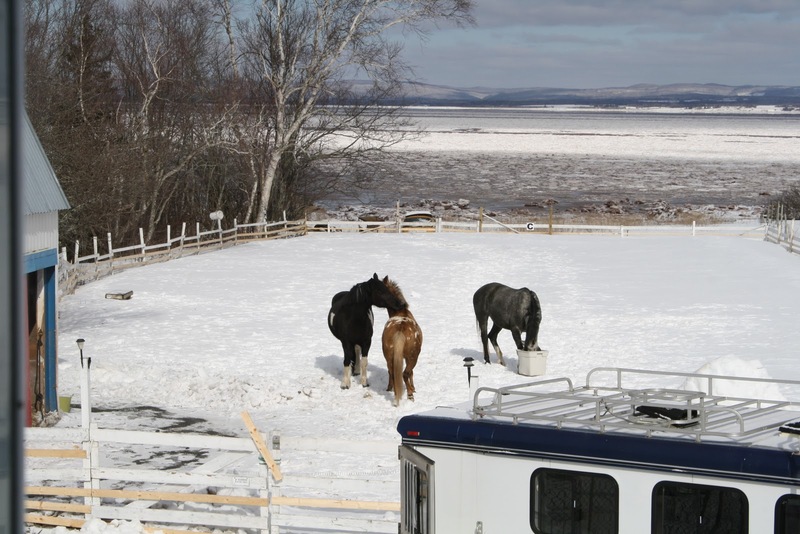 I'm glad the horses are home now! I really want to go up there for a couple days sometime soon. I'll give you a call :) Love you! As always, your place is absolutely gorgeous. I love it, and I'm sure they're happy to be home. Boarding is always an adventure, isn't it? I'm currently trying to get my BO to even RETURN a phone call, text message, or email. Been going on 3 days now with messages from me in all three contexts, and no response from her. I am so happy they are safe and home. Goals can wait. Confident, relaxed happy horses can't. I love that you can see them from your house. Glad they are home and enjoying themselves. I'm sure they were at the boarding facility clicking their hooves together with their eyes shut chanting "there's no place like home" for a while and now their dreams have come true. We're still basically under snow and ice here too. But warmer temps should be on the way for all of us soon and it will all melt. It's so nice to have the herd home safe and sound though isn't it. Just so much peace of mind when you can look out and see what they're doing and knowing they're getting the best of care. Have fun. Carol, Oh, they look so happy to be back! 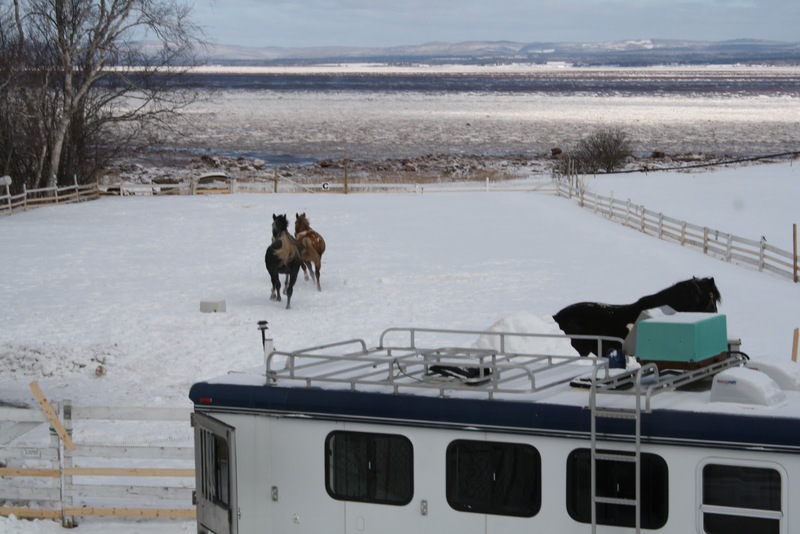 I'm glad you got them home, and got wonderful help from Doug's brothers- scary to trailer your precious horses when the footing or road conditions are bad. What a beautiful view you have! And I agree with you- riding goals can wait, and you can do groundwork in the meantime if you want. The most important thing is that they are back, safe and sound, and happy!